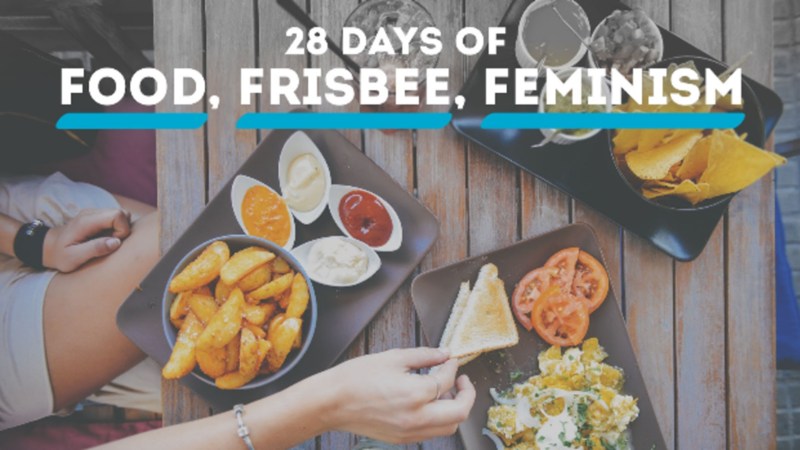 28 Days of Food, Frisbee, and Feminism is an initiative started in 2017 by Tiina Booth, Zara Cadoux, Chip Chang, and Tulsa Douglas. They saw that the ultimate community was ripe and open for conversations about gender equity, racial diversity, and feminism and decided to do something about it. In our current socio-political climate, we find these conversations to be imperative, now more than ever. It can be difficult to find spaces created to encourage these uncomfortable but critical conversations, so we decided to dedicate one whole month to challenging ourselves and other ultimate community members to take the initiative. Every February, 28 Days of Food, Frisbee, and Feminism encourages local conversations and seeks to empower people within their communities to engage in discussions that otherwise might not take place—all while sharing our favorite foods and stories. It can be as formal or informal as you want; a casual conversation over dinner with a few of your closest friends or a coordinated conference with folks from all over the city. Invite your friends! It can include youth participants, parents of young players, club level players, or casual league/pick-up players. The beauty is that anyone can host a conversation! Anything goes. Whether this is the first time you’ve organized a conversation or you’re an established leader in your community, we want to support you in getting these conversations started. Plus, there’s an entire community of awesome people behind you.